STORMHAWKS AT THE DINER (SCI-FI / DARK COMEDY) LANGUAGE Our Fair City is a post-apocalyptic science fiction / dark comedy audio drama set in the not so distant future where the skies are stormy, and the landscape is a vast frozen tundra. Lightning rigs high above the city gather energy from thunderstorms, mad scientists walk the earth, and adorably monstrous Molepeople dig tunnels deep underground to expand the city’s habitable space. We return to Al’s Bar on C-deck, where Neal searches for Allison, Loamy gets tough, and the Lightning Riggers are almost helpful. THE INCIDENCE OF ACCIDENTS (SCI-FI / DARK COMEDY) LANGUAGE Our Fair City is a post-apocalyptic science fiction / dark comedy audio drama set in the not so distant future where the skies are stormy, and the landscape is a vast frozen tundra. Lightning rigs high above the city gather energy from thunderstorms, mad scientists walk the earth, and adorably monstrous Molepeople dig tunnels deep underground to expand the city’s habitable space. Nathan begins his work for VP Davenport, makes too much noise early in the morning, and makes a new “life-long” friend. SELF HELP FOR DUMMIES (SCI-FI / DARK COMEDY) LANGUAGE Our Fair City is a post-apocalyptic science fiction / dark comedy audio drama set in the not so distant future where the skies are stormy, and the landscape is a vast frozen tundra. Lightning rigs high above the city gather energy from thunderstorms, mad scientists walk the earth, and adorably monstrous Molepeople dig tunnels deep underground to expand the city’s habitable space. We return to the domicile of a certain flesh-eating walking corpse and her hapless collaborator, both of whom would prefer not to be characterized as such, thank-you-very-much. BUTTERCLAWS (SCI-FI / DARK COMEDY) LANGUAGE Our Fair City is a post-apocalyptic science fiction / dark comedy audio drama set in the not so distant future where the skies are stormy, and the landscape is a vast frozen tundra. Lightning rigs high above the city gather energy from thunderstorms, mad scientists walk the earth, and adorably monstrous Molepeople dig tunnels deep underground to expand the city’s habitable space. In which Neal commits less-than-grand theft auto, Candice is dubiously helpful, and Loamy loses her cool. FEALTY/FRAILTY (SCI-FI / DARK COMEDY) LANGUAGE Our Fair City is a post-apocalyptic science fiction / dark comedy audio drama set in the not so distant future where the skies are stormy, and the landscape is a vast frozen tundra. Lightning rigs high above the city gather energy from thunderstorms, mad scientists walk the earth, and adorably monstrous Molepeople dig tunnels deep underground to expand the city’s habitable space. In which we discover the whereabouts of Nathan Rourke, meet more of the Davenport family, and learn a bit more about the “Human Resources” department. NEIL HENDERSON IN THE WILDERNESS (SCI-FI / DARK COMEDY) LANGUAGE Our Fair City is a post-apocalyptic science fiction / dark comedy audio drama set in the not so distant future where the skies are stormy, and the landscape is a vast frozen tundra. Lightning rigs high above the city gather energy from thunderstorms, mad scientists walk the earth, and adorably monstrous Molepeople dig tunnels deep underground to expand the city’s habitable space. In which Neal Henderson meets several new friends, makes unconventional wardrobe choices, and returns to the loving embrace of HartLife. PURDY AND CHASE – EPISODE 4 (COMEDY / MYSTERY) In our final episode ‘Texas, Maybe’ Pen and Daisy are beginning to show signs of competence. As they embark on a future together, we are left feeling that it could all start to work out for them both in Wexton, maybe. 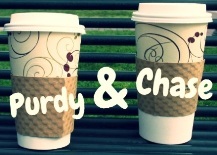 A peculiar pair thrown into unusual situations, Purdy & Chase explores the humorous inadequacies and unexpected heroics.